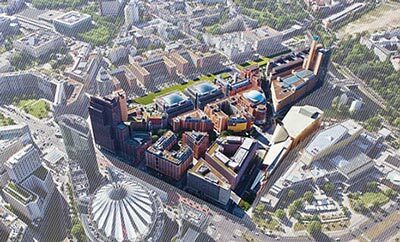 Quartier Potsdamer Platz was developed by Daimler and opened 2.10.1998. It encompasses 19 buildings, 10 streets and two squares or forums. On a total floor area of 550,000 m² (5,920,150.7 ft²) there are – along with offices and residential apartments – two hotels, a cinema, three theaters, a casino, two nightclubs, two health centers, a shopping mall with over 130 shops, as well as some 30 restaurants, bars and cafés. Up to 100,000 people come daily to experience the unique mixture of art, entertainment, shopping, and cosmopolitan flair – and not least of all to savor a sense of the history there. 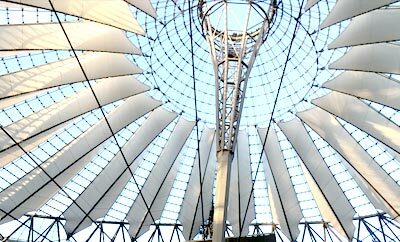 Year after year, the Sony Center on Potsdamer Platz, Berlin’s new city center, casts its spell on some eight million visitors. Seven buildings of glass and steel and a light-flooded forum with a spectacular roof provide space for the modern lifestyle: entertainment and events, cafés and restaurants, working and living in the heart of the capital. You’ll be thrilled by the exciting architecture and the wide range of first class cultural offerings, cinemas, and events. Stroll through the shops, enjoy the wide variety of restaurants and experience the unique atmosphere of Berlin’s distinctive and prominent landmark.